If you’re looking for a garage door that will improve your curb appeal while protecting you from the elements, our carriage style garage door is your best option in Chicago. It’s the perfect combination of beauty and brawn. 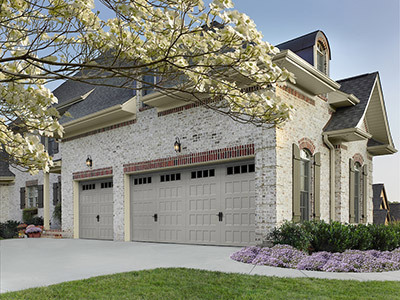 Our carriage style garage doors have a traditional look and decorative design that’s sure to catch the eye of your friends and family. You’ll improve your Chicago home’s curb appeal as well and stand out from other sectional garage doors. You want to get a sectional garage door that’s built to withstand Chicago’s weather. Whether it’s snow, rain, hail or heavy wind, our carriage garage doors can handle anything thrown their way. 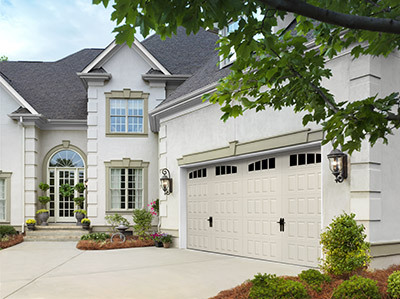 Your carriage garage door will stand the test of time and look gorgeous while doing it. Our carriage style garage doors are foam insulated meaning your garage will be more energy efficient. If your garage is attached to your home, then you’ll feel the effects inside too. Your home will be more comfortable year round (especially rooms that share a wall with your garage) and you’ll save money on your energy bills. Why does the energy efficiency of your carriage garage door matter if your garage isn’t attached to your home? You garage may house your car, lawn equipment, tools and electronics. You don’t want these items exposed to extreme temperatures. The foam insulation in your garage door will also prevent you from hearing outside noise and heavy wind. If your garage is attached to your home, then you’ll also have a quieter home. We offer different decorative hardware for our carriage style garage door. Different handles and hinges help your door standout from other sectional garage doors and it’s sure to improve your home’s curb appeal. With different panel, window insert and color options, you can completely customize your carriage style garage door in Chicago. All of our garage doors are custom-made, going beyond the standard 16-7’ garage door to be made to almost any size.